Discover Palm Valley Country Club Homes for Sale – Palm Desert Real Estate! 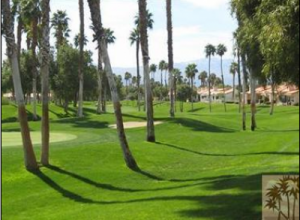 The private, gated golf community of Palm Desert Country Club is located off Country Club Drive between Washington Street and Cook Street in Palm Desert, CA – just 10 miles from Palm Springs. Developed in 1983 by Sunrise Company, the exclusive golf community includes 1,274 luxury condos/townhomes surrounding two Ted Robinson, Jr. designed 18-hole golf courses. If you would like to set up a private showing or would like more information about any of the above Palm Valley Country Club homes for sale, please give award-winning Palm Desert REALTOR® – Elaine Stewart a call. Elaine specializes in luxury real estate and would be delighted to answer any questions you may have. Call today! 760-668-2399. This highly desirable, private community features 1,274 luxury condo/townhomes ranging in size from 936 square feet to 2,489 square feet. Palm Valley Country Club homes for sale come with two to three bedrooms and are priced from $235,00 to $475,00. *HOA $438 monthly, plus $99 monthly Social/Fitness Membership. (*prices/dues/fees subject to change). The median home value in Palm Desert is $335,800. Home values have gone up 5.4% over the past year. The median price of homes currently listed in Palm Desert is $390,000, and the median price of homes that recently sold is $337,500 (source). Owned by National Golf Properties and managed by American Golf Country Clubs, Palm Valley Golf includes 2 challenging Ted Robinson Jr. courses: a championship 18-hole par 72 course and an 18-hole par 63 Challenge Course. There’s also a full driving range and a short game practice area with a chipping green, practice bunkers, and a large putting green. Along with two championship golf courses, this premier golf & lifestyle club features an array of world-class amenities including a 100,000 square feet clubhouse, a well-appointed golf and tennis pro shop, men’s and ladies’ locker rooms ( jacuzzi, sauna, and steam), two restaurants and a lounge, 16 tennis courts with a stadium court, a Jr. Olympic-size lap pool with a Jacuzzi and cabana area, a state-of-the-art athletic club, aerobic and fitness classes, a premier Day Spa (offering massage, facials, and full-service hair salon), and a full schedule of exciting golf and social events. Members can choose to spend their morning on one of the breathtaking golf courses, play a game of tennis, work out in the fitness center or simply relax poolside and escape from the hustle and bustle of everyday living. From specialty dining events, holiday celebrations and family fun days to tournaments and social activities, Palm Desert Country Club offers countless opportunities for members to relax, have fun, network, socialize, and experience a sense of camaraderie among friends! With over 24 years of real estate experience, Elaine Stewart offers a wealth of local market knowledge and expertise. As a licensed, professional REALTOR® and Luxury home Specialist, Elaine is fully committed to providing her clients with accurate, reliable and trustworthy information and the personalized service they deserve. Elaine truly enjoys helping her clients get into their dream home in the Coachella Valley and is an expert at uncovering the right homes in the right neighborhoods that are the best match. Elaine would be delighted to speak with you about Palm Valley Country Club and help you decide if this exceptional community is the right fit. Please give award-winning Palm Desert REALTOR® – Elaine Stewart a call today at 760-668-2399 or fill out the online contact form and she will be more than happy to answer any questions you may have.